Like Annie and Owen’s trip to Salt Lake City, the actual destination of Maniac feels less important than the fact that we went on the journey in the first place. The psychological issues the pair were dealing with, and the overarching stories about their respective families, were more of a delivery mechanism for goofy stories where Emma Stone and Jonah Hill wore knockoff Lord Of The Rings costumes, tube socks, and all manner of wigs. And, for the most part, that’s fine—there’s a lot of frustrating material here, but there’s enough to hold onto that “Option C” doesn’t feel like a total letdown. Instead, it’s a mostly-satisfying ending, as long as you weren’t expecting something totally insane. The best thing about “Option C” is that it never suggests that Annie and Owen’s connection is actually romantic in nature. Instead, the script mocks that possibility in the highlight of the episode: a scene where Annie hires a Friend Proxy, played by Ben Sinclair of High Maintenance, to pretend to be Owen. The stand-in tries to propose to Annie, going through the motions of a marriage because that’s what it seems like he’s supposed to do. But their relationship is really just a friendship between two weirdos surviving in a world that doesn’t quite understand them. It’s hard enough to connect with people as it is. Besides, there’s another romance at the end of the series, one that should do more than enough to whet anyone’s desire to see characters get together: Drs. Fujita and Mantleray, who have lost everything professionally, but found each other (again). The scene of Dr. Mantleray and Dr. Fujita in the elevator is a lot of fun, largely because of the brief interlude where they see a guy wearing a burnt and possibly blood-stained containment suit while screams echo in the distance. (“Remarkable work they’re doing up there,” Dr. Mantleray says.) I’m not super into the underlying dynamics of the relationship, founded as it is on a fantasy in which Dr. Fujita is Dr. Mantleray’s first mate. It’s been pretty obvious that this was where their story was going, and with the exception of some brief outbursts, Dr. Fujita hasn’t gotten nearly enough depth outside of her relationship with Dr. Mantleray. At least there’s some room for Dr. Fujita’s needs in this fantasy; after all, she doesn’t like boats. Also, she owns a Mercedes with flames on the side, which is cool. Annie and Owen mostly have their own issues to deal with. Owen writes a note to Olivia, and then has to decide what to do about the trial. His mother’s brief appearance describing “these women who make false accusations against the wealthy” and the service they ostensibly use to hire people to intimidate witnesses is fascinating, and suggests a direction the show could have gone by exploring the pathology of needing to treat yourself like a victim, even when you’re flexing all the power in the world. During the trial, the lawyer representing the plaintiff presents pretty clear video evidence of Jed’s assault—evidence that probably would have been given to the other lawyers, in a normal case? (It’s unclear what kind of proceeding this is.) Somehow the entire trial comes down to whether or not Owen recognizes Jed in the video, which is such a thin way to put Owen in the moral hot seat that his eventual (and, again, inevitable) decision to be honest about how terrible Jed is feels more perfunctory than it does climactic. That’s too bad, since we’ve ostensibly been waiting eight hours or so for this moment. Annie, meanwhile, visits her dad (played by Hank Azaria) and has a very reasonable, human conversation with him, in which they’re honest with each other and talk about their feelings. Annie’s mom apparently had some mental health problems, too, something we didn’t know earlier in the show. Eventually, she tries to go find Owen to ask him to go to Salt Lake City with her—she wants him to be weird and intense about their relationship, after everything they’ve been through. In the final sequence of the show, Annie comes to visit Owen in the psychiatric facility. Using her Long Island accent, Annie sneaks in, and manages to convince Owen that he should, in the parlance of this kind of story, embrace life—and, more importantly, that he shouldn’t be treated in that particular facility. (Owen probably should be diagnosed and medicated, though!) Eventually, they break out and steal away in the truck with Annie’s new dog, heading out into the sunset. This is a sweet ending but, like a lot of Maniac, it falls apart under a little more scrutiny. I want to close by focusing on these final moments—and, in particular, when Annie asks Owen to meet her in the bathroom as a way of sussing out whether he wants to leave the facility and commit to their connection. Among other things, this moment is a strong case of the show’s editing really being an issue: The scene cuts right from Annie walking into the bathroom to Owen meeting her, without any sense of hesitation or Owen thinking about what to do. Lots of Maniac has been intentionally disorienting, but this is one moment that really shouldn’t be. 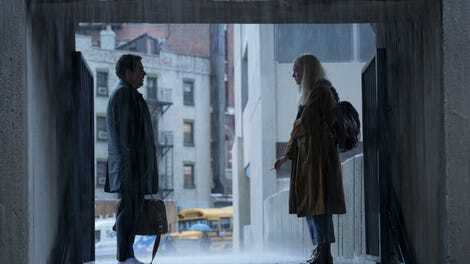 Annie and Owen’s connection is the center of the show—whether there’s a deeper reason that they kept showing up in each other’s reflections besides GRTA’s grief-induced “hardware error.” Maniac doesn’t need to have singular, clear statements on this, or any other question, but it does need to have a specific way of asking. 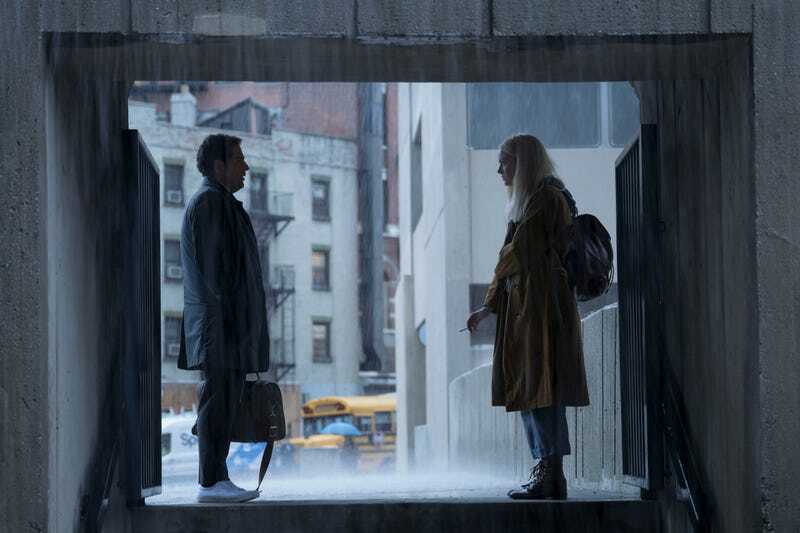 For the most part, Maniac felt to me like a sort of algorithmically driven, kaleidoscopic cross-section of three or four different really interesting shows, each blurring into the others in ways that were occasionally compelling, but mostly confusing and listless. Fukunaga’s directing is sharp in this episode, as it has been throughout the season, but there are almost no moments that he uses the camera to express an opinion or view about any of the stuff happening. For a show that’s this internal, it has awfully dispassionate visual presentation. Consider: The “Option B” Owen was so concerned about in therapy of wasn’t the possibility that Annie would reject him. Instead, he was worried that he would prove to be the real problem, lashing out in ways that sent her running after they’d already developed a degree of intimacy. Really, he’s so afraid of pushing people away that he never lets himself get close to them in the first place. There’s a certain theoretical elegance and cleverness to this, but it’s also a very normal, very relatable problem—one that, for the most part, really does not want to appear conventional, even though Maniac’s cold presentation makes it seem like it should something we’ve never seen, somehow. Even now, it’s hard to say whether that was a conscious decision, which leads me to think that it wasn’t; the show just threw it out as one more small, potentially interesting creative decision, without letting it shape anything else happening around it. There wasn’t much hidden at the center of this candy-coated show—but at least the candy was good. I’d been waiting the whole season for someone to ask “How’s Annie?” in a reference to the original Twin Peaks finale. But Owen waking up to ask “Annie are you okay?” is also pretty good. Justin Theroux saying “You know how to drive?” is the most romantic thing that’s happened on the show, especially since he’s saying it with the awe of a person who has apparently spent most of his life living in New York. I love that Risk is the stand-in for evil family play in Owen’s first round of false testimony. Other than that, things largely seem to go back to normal. Annie apologizes to Patricia, who is making sure everyone adheres to their NDAs. Dr. Mantleray hesitantly suggests having lunch with his mother, only for her to reveal that she’s about to leave on a book tour and won’t be back for an indeterminate amount of time.